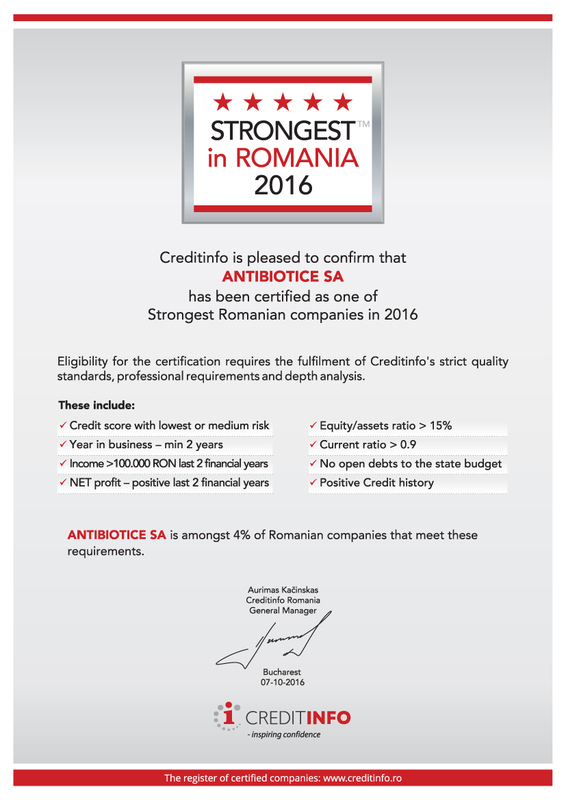 Antibiotice has obtained the certificate “Strongest in Romania” 2016 granted by CreditInfo. This certificate proves that Antibiotice is a financially responsible company, showing solvency and credibility to partners at home and abroad. The certificate “Strongest in Romania” is awarded annually on the basis of some requirements which include the credit score (low and average risk), return on equity (>15%), current liquidity (>0.9), net profit (positive in the last two fiscal years), positive credit history, no debts to the state budget, turnover (>100.000 LEI in the last two fiscal years), company’s age in the market (at least 2 years). According to these criteria, Antibiotice is among the 4% companies meeting these requirements, in 2016 being one of the strongest companies in Romania.